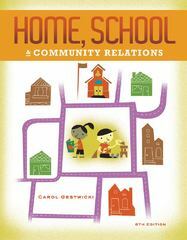 Home, School, and Community Relations 8 Edition This practical book is an indispensable guide for home-school-community collaborations. It meets the needs of current and practicing teachers, as well as administrators, who are trying to create effective partnerships with families. An overview of modern families and their complex roles sensitizes teachers to the diversity and needs of families they will encounter. The book also fully discusses both the benefits of creating productive partnerships and the barriers that teachers must overcome. Abundant examples clarify the book's practical and effective communication strategies. Current developments in the field of early childhood education are emphasized, including legislative mandates in education, professional standards of the field, and strategies for working with families of students with diverse learning needs.